I want start out tonight talking about our Rosé wine. And, if you bear with me a bit there really is a link to tonight’s celebration of IWD. Most of you know we have a new winemaker, Virginie Bourgue. We are going to release her first Olympic Cellars wine during the July 4 weekend. It’s a beautiful 2010 Lemberger Rose known to all as Rosé the Riveter and affectionally known as Rosie. So my first thought… how best to distinguish her wines from Benoit’s, market and celebrate Virginie’s first Olympic Cellars wine release? 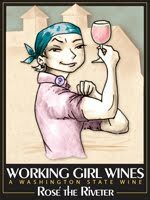 Lisa came up with the answer… bring back the Dungeness Rosé label which I retired years ago as the Working Girl Wines evolved and the Rosé the Riveter label was conceived. A perfect solution. You know we tend to go back to our roots in life and for us our winery heritage. For those of you that know me, you know my brain may be miss-wired. I think there is a ping pong ball inside my head. As a thought or idea starts to form, it bounces precariously around. When I make a decision… if I described the path it took through my brain you would definitely label me certifiable. But I’m going to explain the path of one idea… Rosie is the perfect example. The work issue… we want to sell out our current Rosé in time to release the 2010 vintage. How best to do this? First, the marketing side of me kicks in… Well, we’ll just announce that the Rosie label is off to the “Cellar” Vault just like Disney. As you know, the studio simply places a moratorium on a film and halts production until the timing is right for a re-release. Issue solved… Rosie will be featured, sold out, not to return until the time is right. Then I got to thinking about Geraldine Hoff Doyle, the face of Rosie that inspired this well known poster by J Howard Miller. Sadly Geraldine passed away on December 30, 2010. Now I’m thinking… Is this a sign? Shouldn’t I retire our Rosie label for good? Next ping pong ball bounce… it’s the 100th Anniversary of International Women’s Day. Pretty momentous occasion. This dayhonors the work of so many, celebrates women's success, and reminds of inequities still to be redressed. That's why we’re here tonight. Oh lord… the ball is bouncing back and I’m thinking… Rosie is part of this 100th Anniversary of Accomplishments. She changed the workplace for women. We can’t retire Rosie! 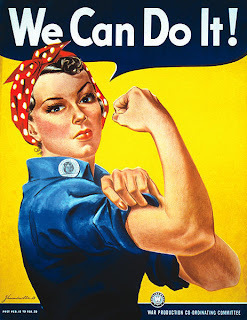 But, Are we past the slogan “We Can Do It”. Didn’t We Do It? Haven’t We Done It?“We’ve Come a Long Way Baby” floated through my mind. Then I gagged, wasn’t that the tag line for the Virginia Slims cigarette commercial? Actually it was YOU’VE Come A Long Way Baby. (To me that is so condescending.) This hideous reminder was quickly cooled by the recollection that Loretta Lynn also wrote a song “We’ve Come A long Way Baby”. OK, I’m feeling Much Better. As women we’ve made monumental strides in every arena of life around the world. And we all know that there is so much more that needs to be done. Damn, I still don’t know what to do with Rosie? So I Googled her and watched A Library of Congress Rosie video 7 times. What stood out in the video is another war slogan that I’ve never seen before: The More Women At Work the Sooner We Win. This slogan obviously is referring to WWII. But I’m thinking… isn’t this more applicable and urgent today? War is everywhere but not here. Hunger is here but not so visible. Education is lacking but we have schools. Violence happens but not in our neighborhood. I could continue but you get the picture. Women have always Gathered and solved problems. It’s in our genetic makeup. So tonight, the 100th Anniversary of IWD I’m personally asking each of you to get involved in something that is core to you and to your roots… where your passion lies. It takes a village and be it a 100 years ago or today, we still have Work To do. Rosie’s Fate? She’s headed to the “Cellar” Vault! She will return, maybe reincarnated. For now, drink her wine…. And consider the possibilities of The More Women At Work the Sooner We Win.